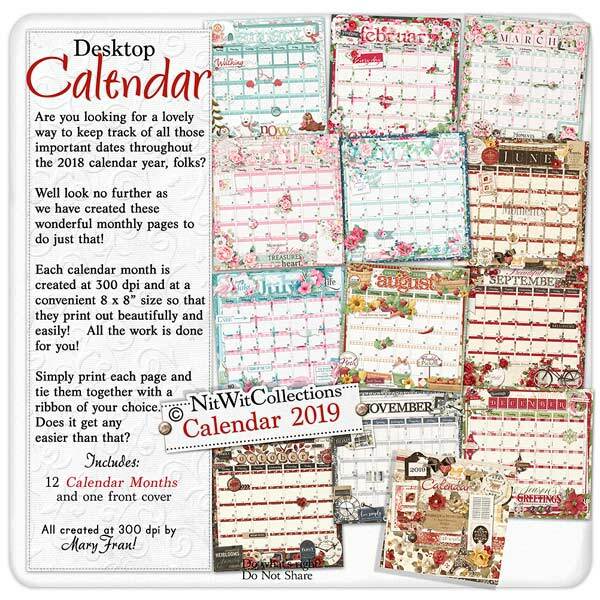 Calendar 2019 is the perfect downloadable, printable desktop calendar that you can use as your daily guide or print it out and give it as a gift! Write in important dates, birthdays, anniversaries, etc. and maybe even journal in when to book your holidays and begin thinking of that fun adventure!! Simply print out and clip together with rings to be used on a desktop but feel free to be creative and change yours up however you would like! Add some ribbon or even put the pages in an 8 x 8 album for someone special! 12 8 x 8" pages for each of the months of the year. Calendar 2019 is not available for License holders use.